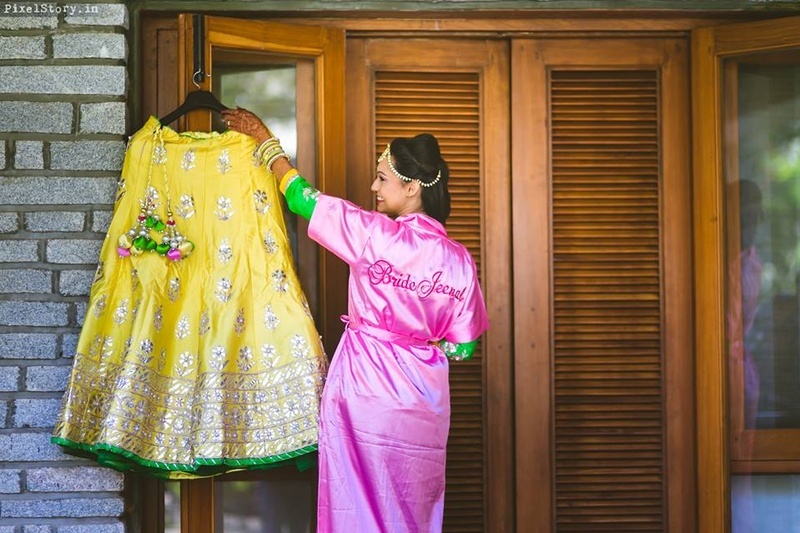 It’s said that a fairy tale usually happens only in books and stories; however this one featuring Jeenal and Pranav happened at Angsana Oasis Resort and Spa, Bangalore. 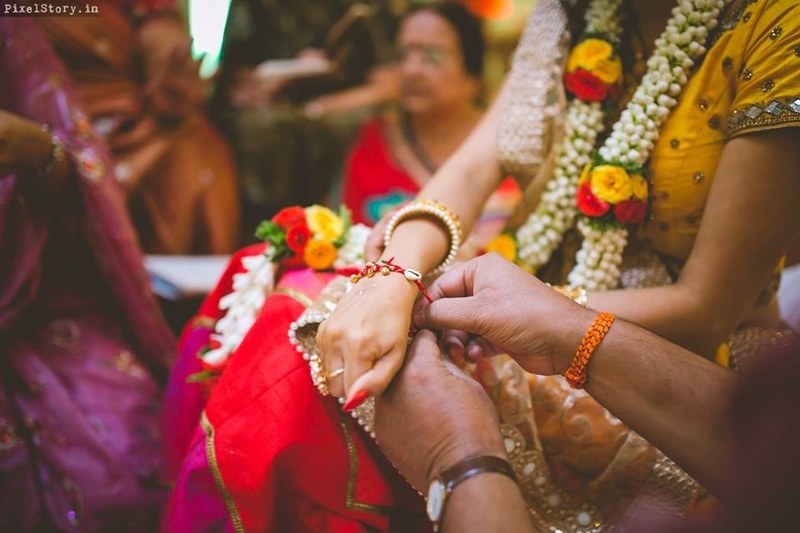 Celebrations began with the Mehandi ceremony with a beautiful Radha Krishna theme - the photos itself tell the story just right. 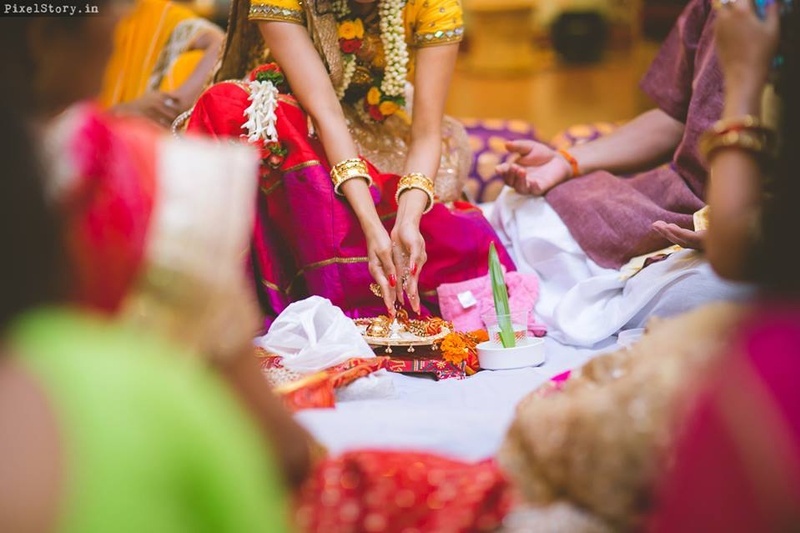 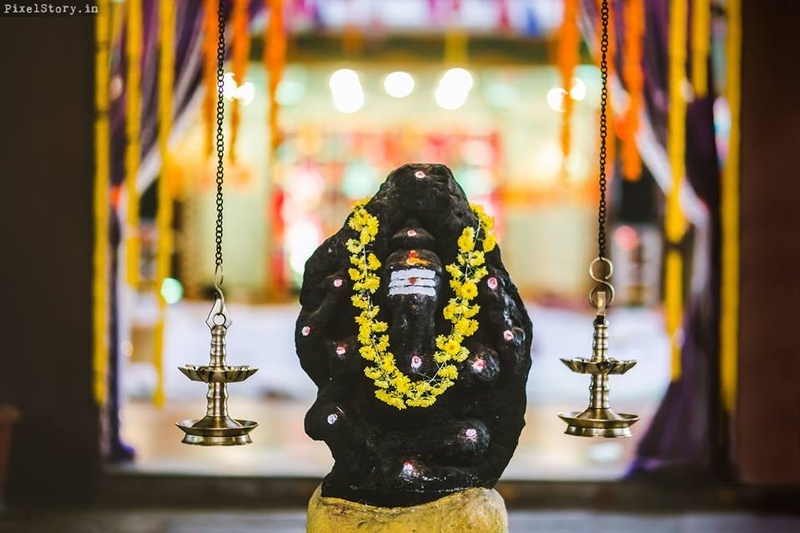 This ceremony laid the foundation for the celebration that was to come! 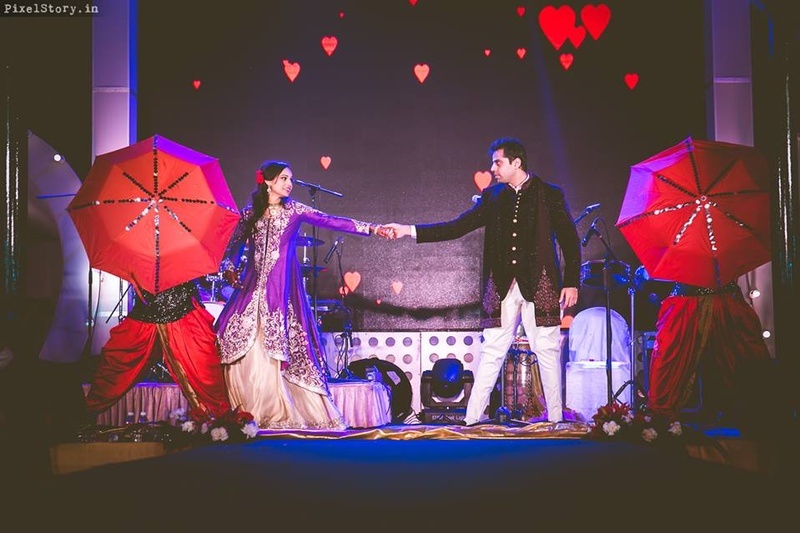 Siddharth Mahadevan and the gorgeous Kakkar Sisters walked into perform for the Sangeet, and as we guessed, it was downright brilliant! 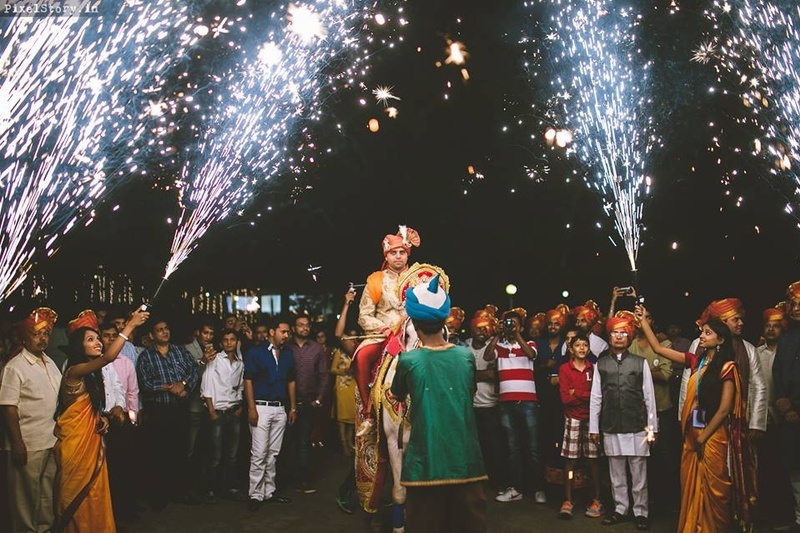 Cause of course they needed stars to perform for this couple who look like they descended from the heavens too! 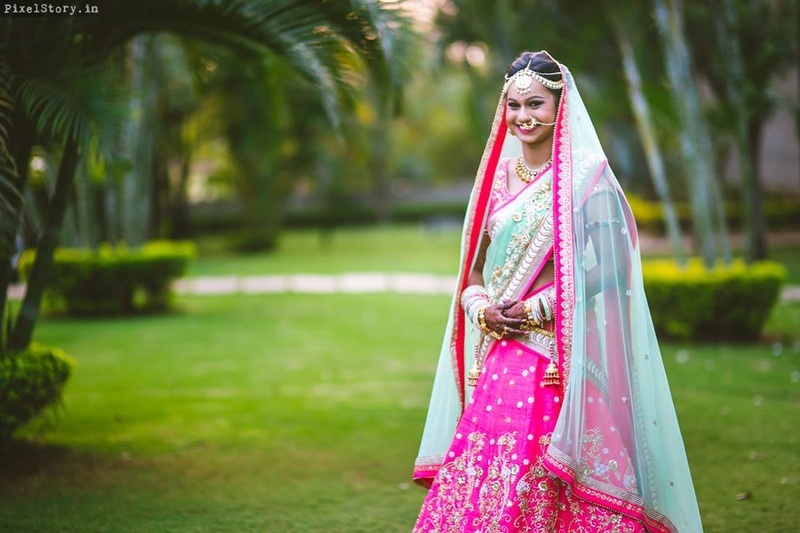 Jeenal dressed in a purple jacket styled blouse and a gorgeous gold lehenga. 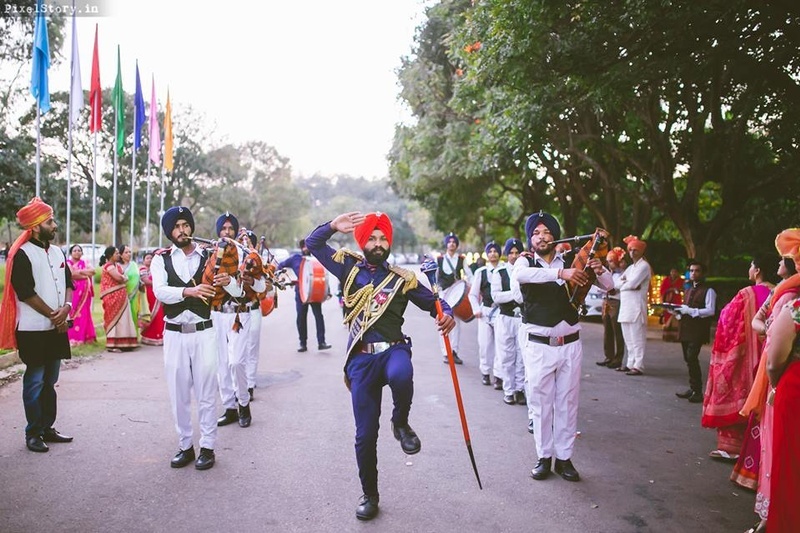 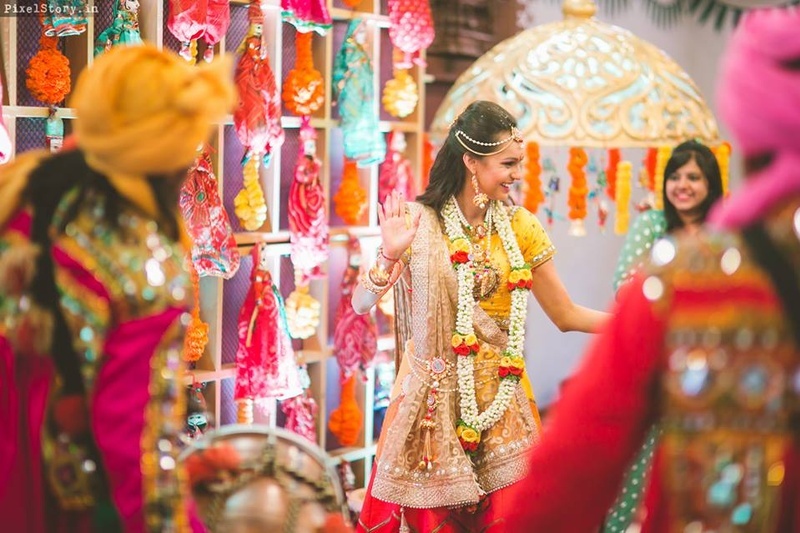 The Phera's certainly should have been the highlight when India’s only walking violinist Aneesh Vidyashankar escorted the bride and groom to the stage, it was time for the fairytale to begin! 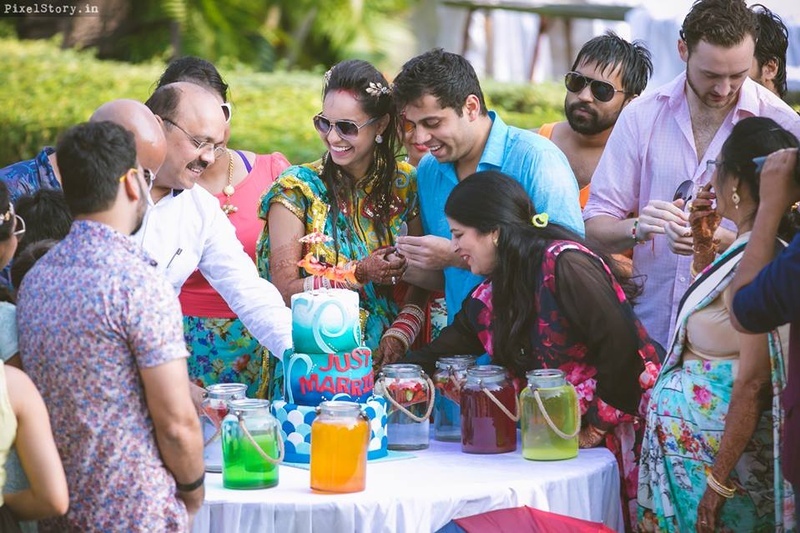 Well began is half done while to conclude such a wedding we needed more fire power hence came in the incredible Silver Strings, the band from Russia and well the party was far from over when everyone jumped into the pool for the “Just Married Pool Party” hosted by DJ Hussain. 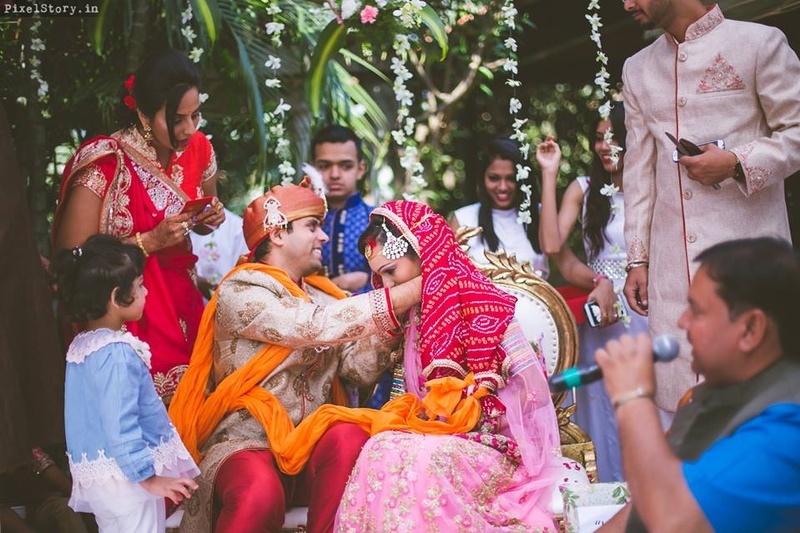 Such elaborate arrangements; the best of performers and always an eye for detail and to stitch this piece of magic the person with the wand was Pritie Jain who has transformed this into one magical fairy tale wedding ! 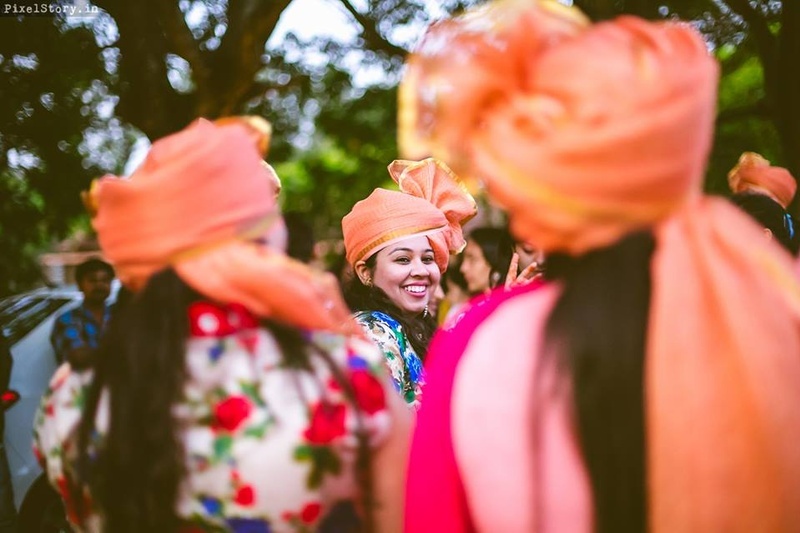 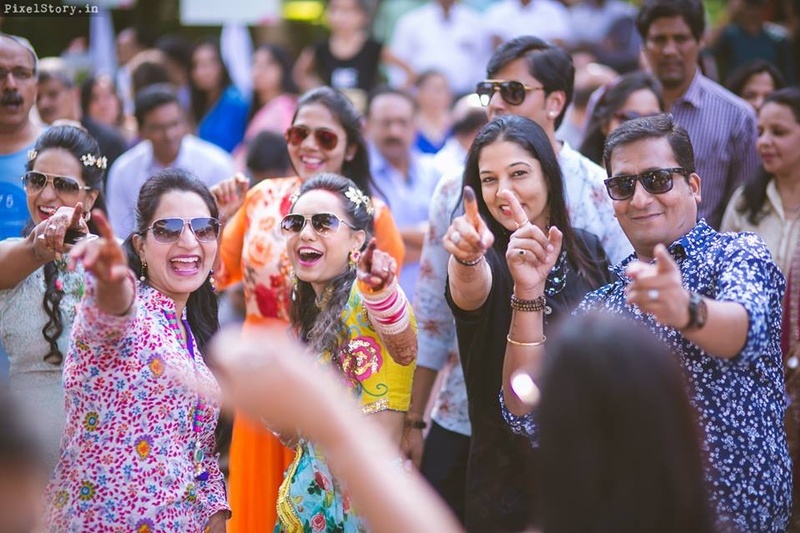 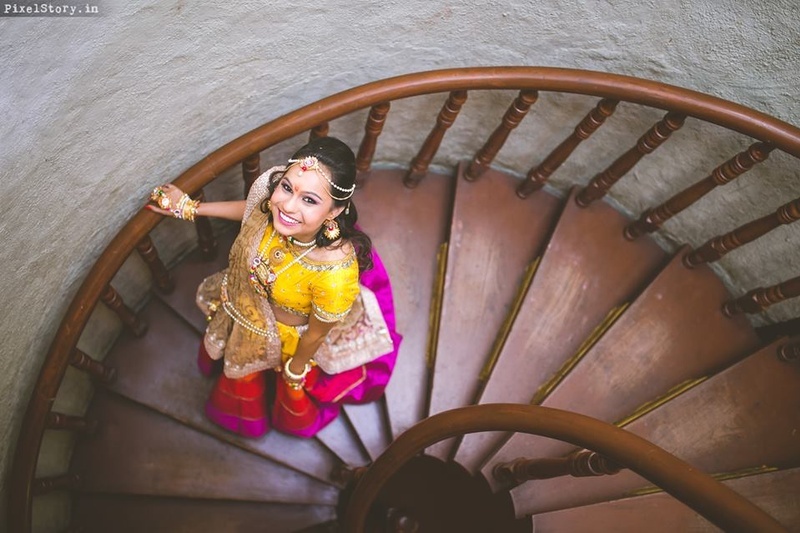 The wedding celebration of Jeenal and Pranav was one endless ride of dancing, singing and merriment, shot brilliantly by Pixelstory.in - They perfectly captured every detail, from the decor to those sweet candid moments in all its beauty! 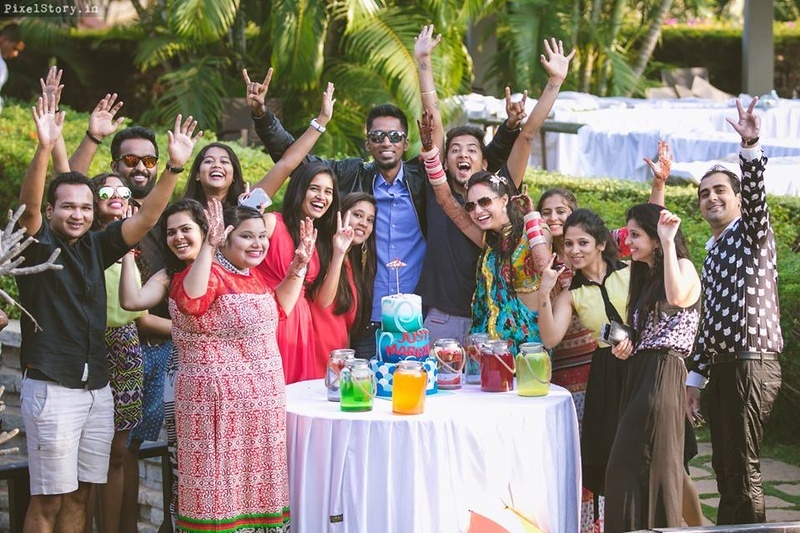 Special Appearance & Performances - Aneesh Vidyashankar , Siddharth Mahadevan, Kakkar Sisters, Silver strings. 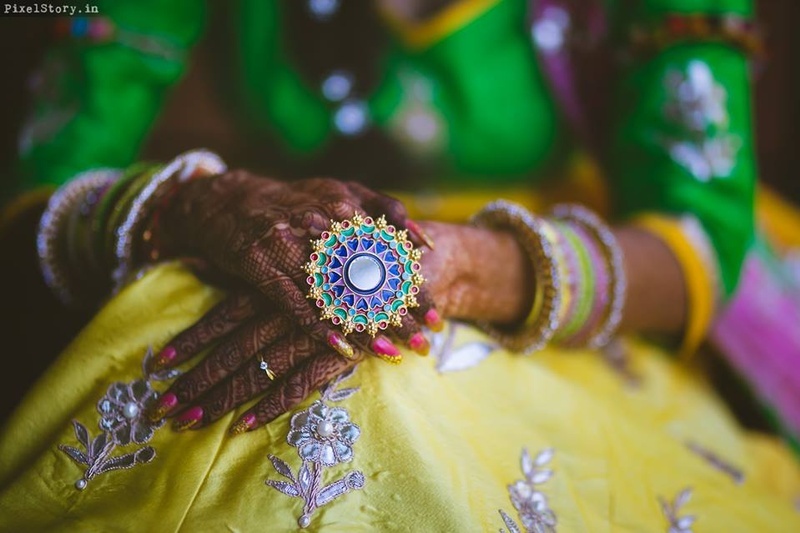 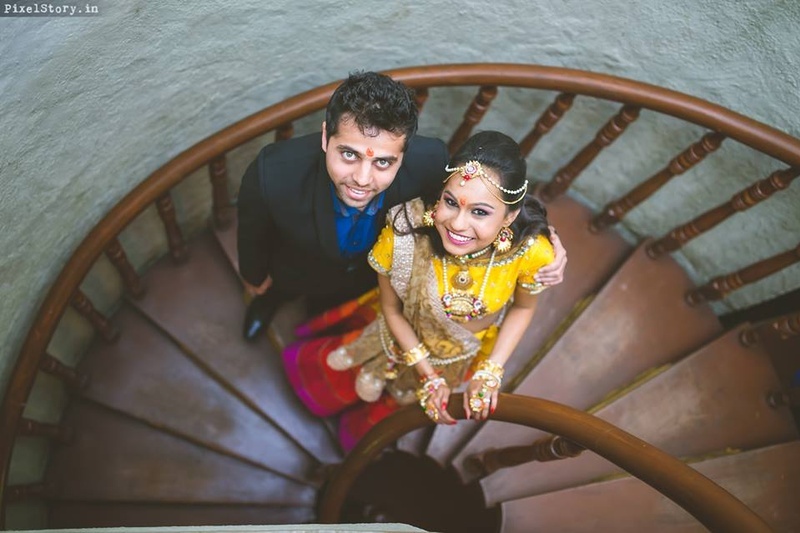 Teaser | Jeenal & Pranav from mananphotography&films on Vimeo. 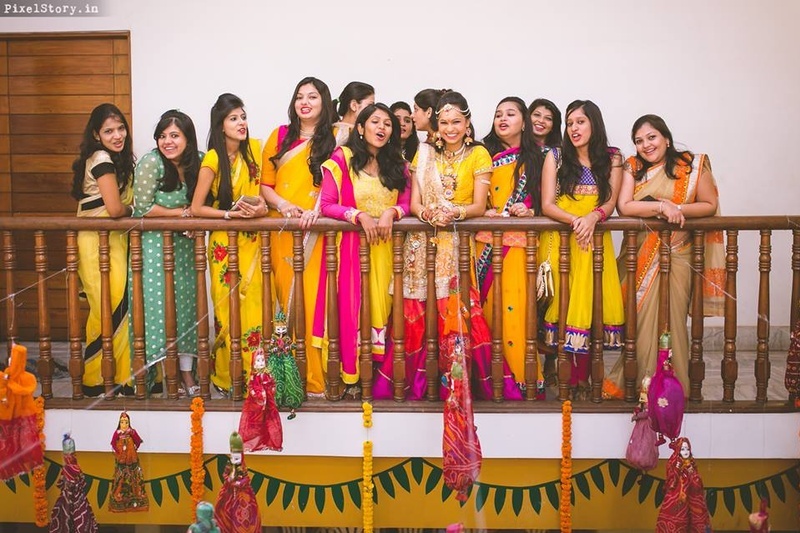 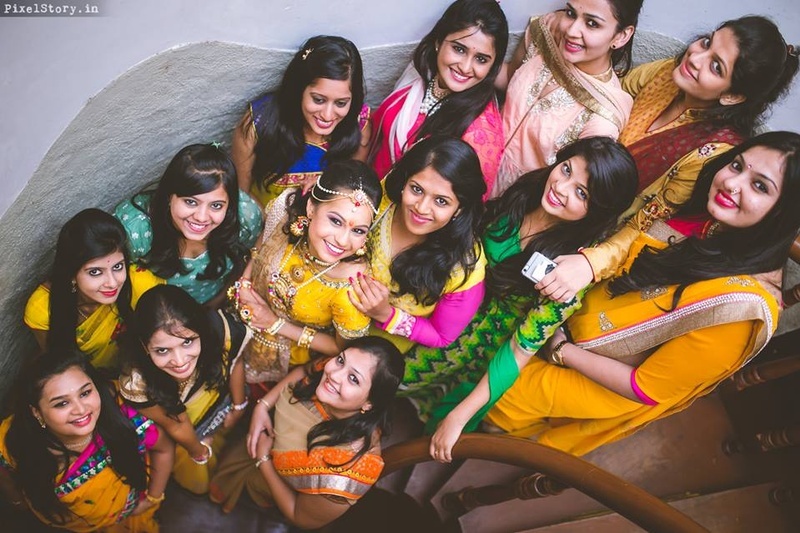 Colorful Bride and Bridesmaids all set for Radha Krishna themed pre wedding ceremony. 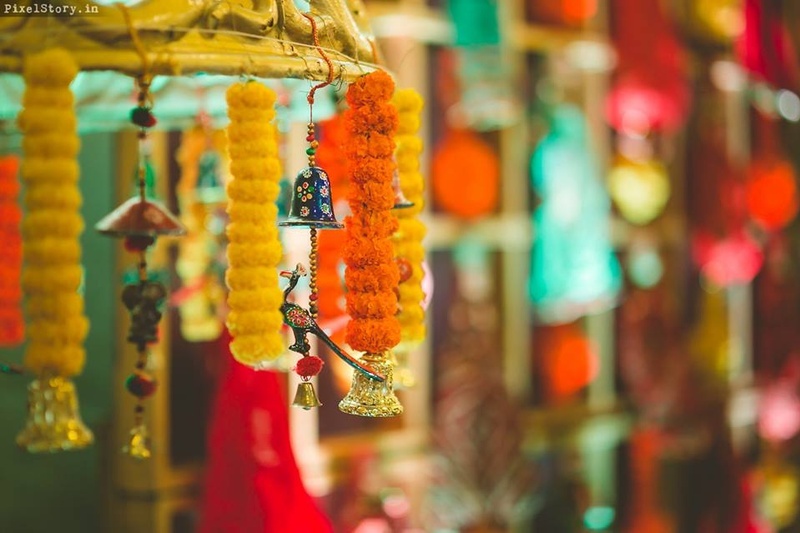 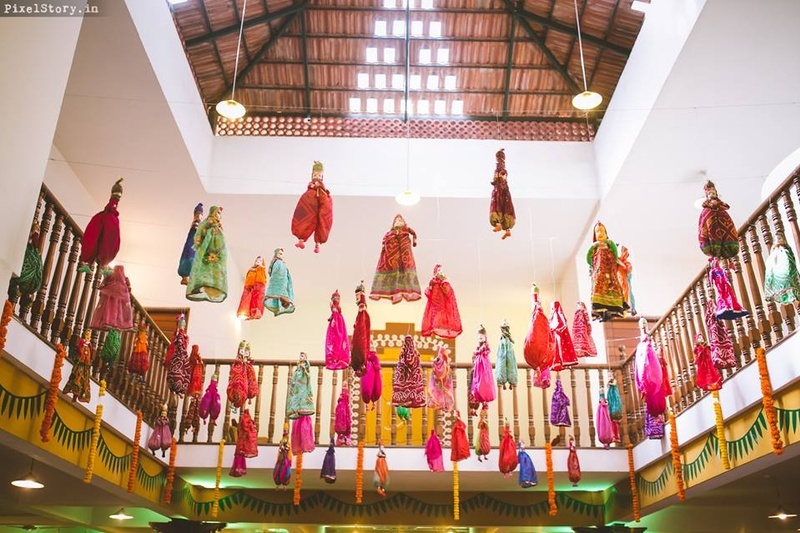 Ethnic Rajasthani dolls decor for the Radha and Krishna themed wedding rituals. 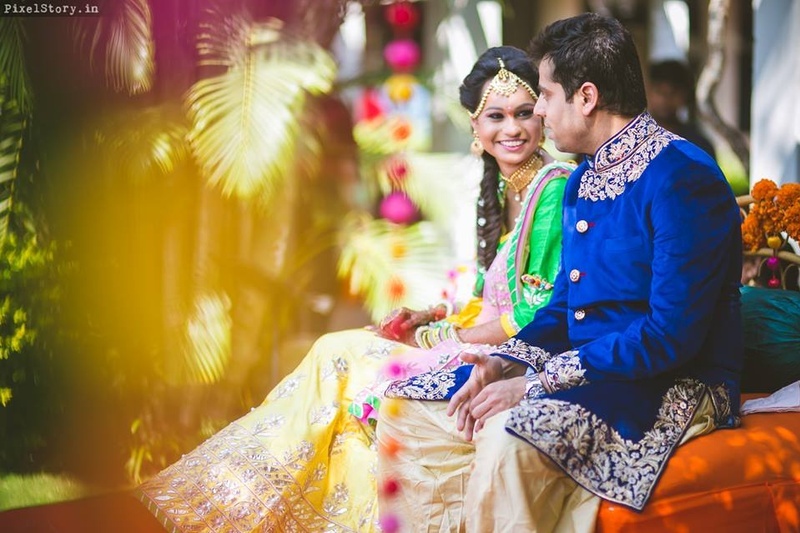 Bride and Groom couple photography ideas. 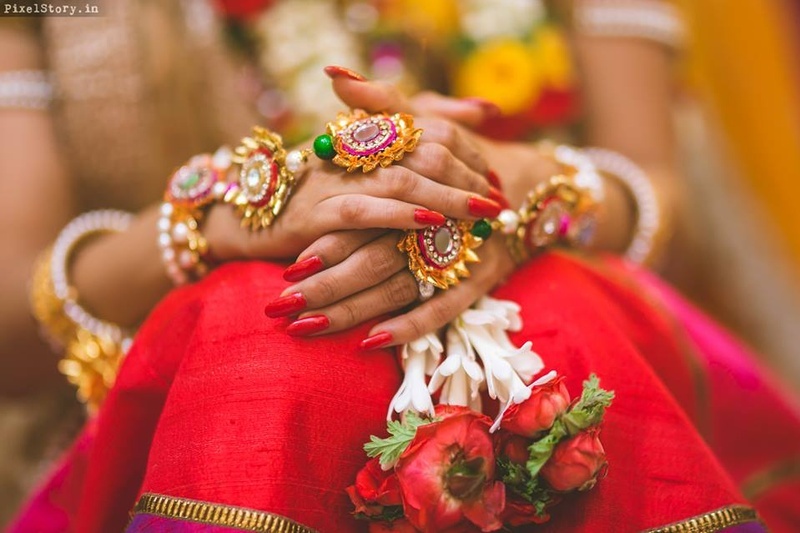 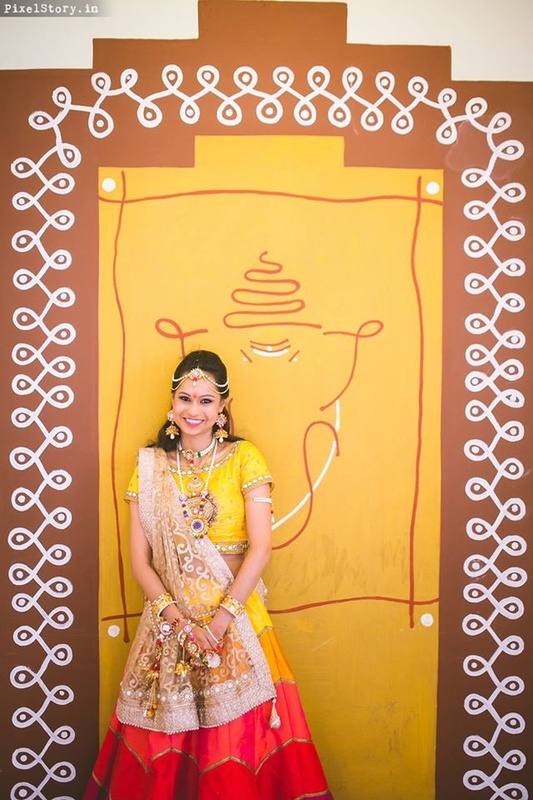 Beautiful Jeenal wearing yellow and red lehenga styled with floral jewellery for the pre wedding rituals. 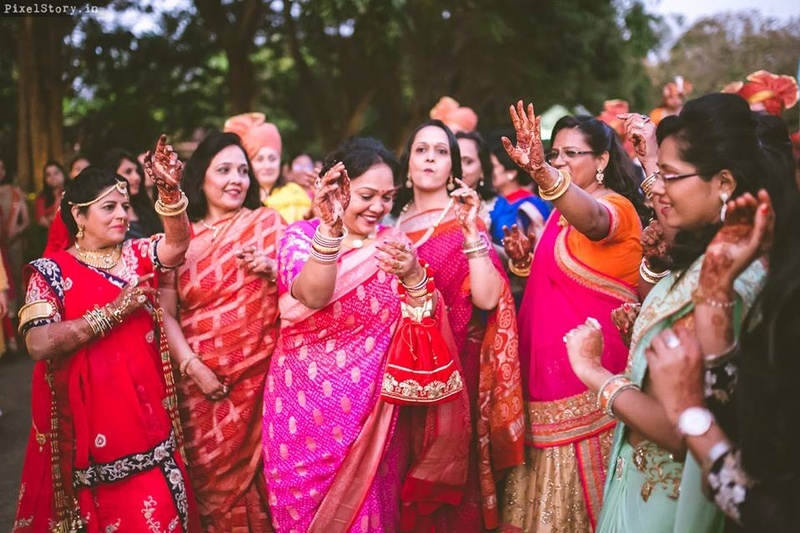 Bride and bridesmaids dancing beautifully. 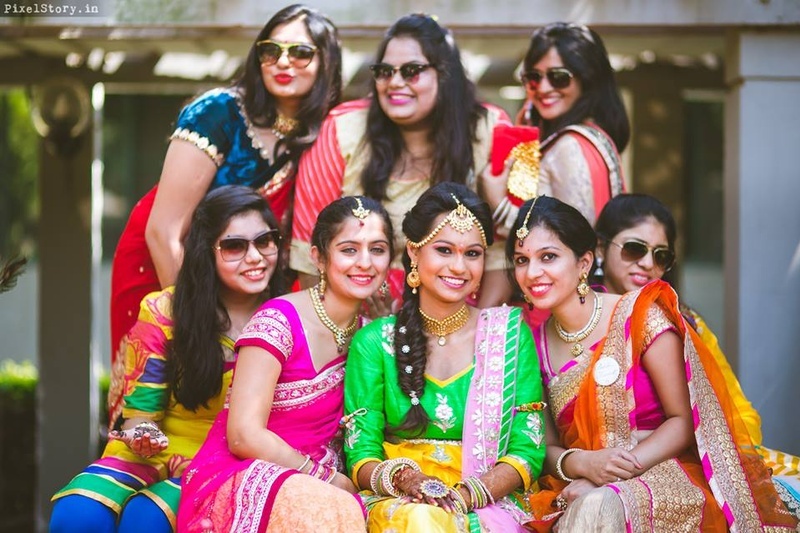 Colorful bride and bridesmaids photography. 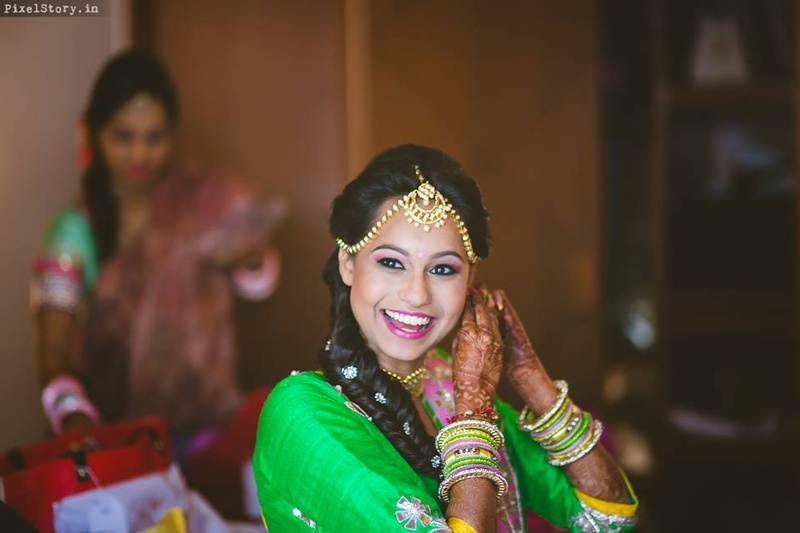 Jeenal getting ready for her Mehendi ceremony. 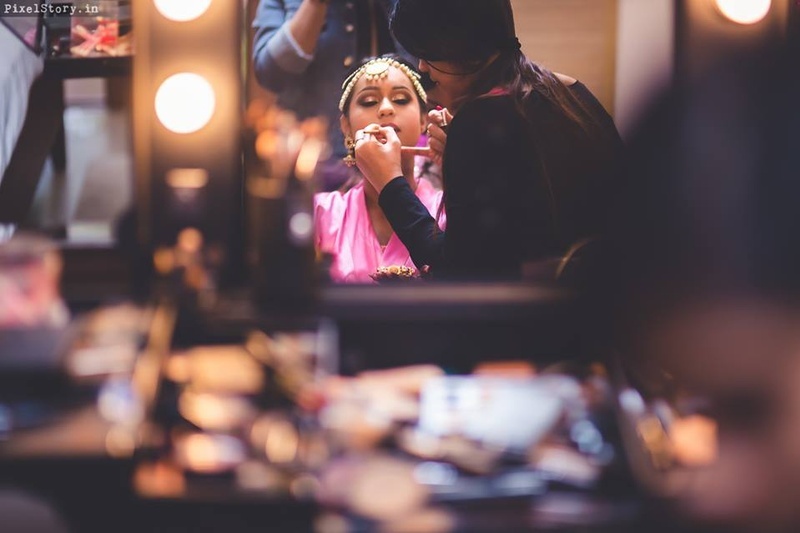 Bridal makeup by Aanchal Balraj. 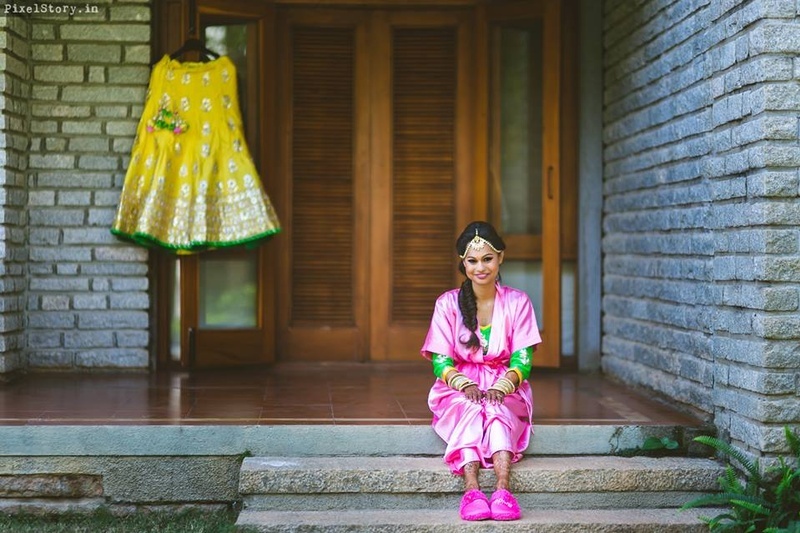 Bride Jeenal with her beautiful bridal Mehendi ceremony outfit. 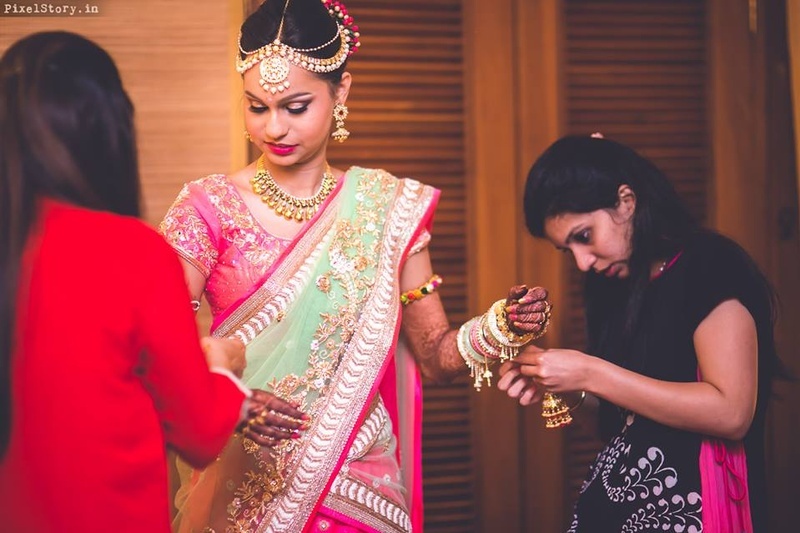 Bride Jeenal getting ready for her Mehendi ceremony wearing beautiful multi string tikka. 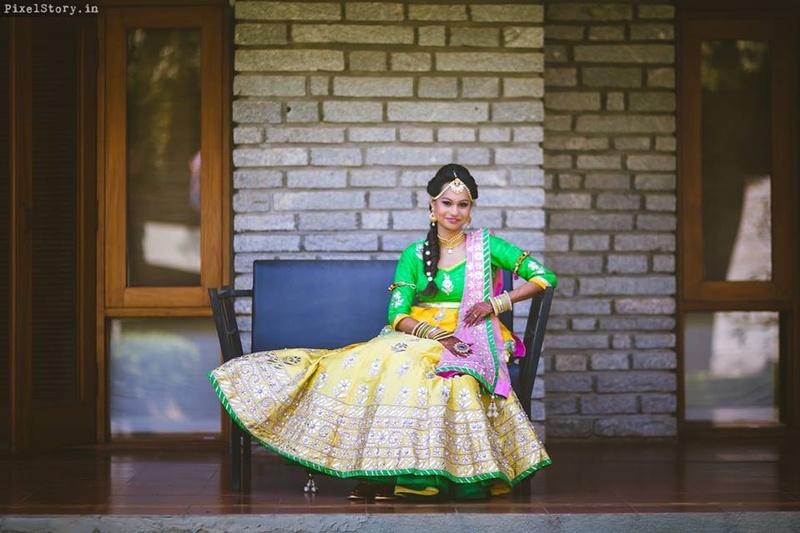 Bride Jeenal wearing green and yellow gota patti lehenga styled with gold jewellery and colorful bangles. 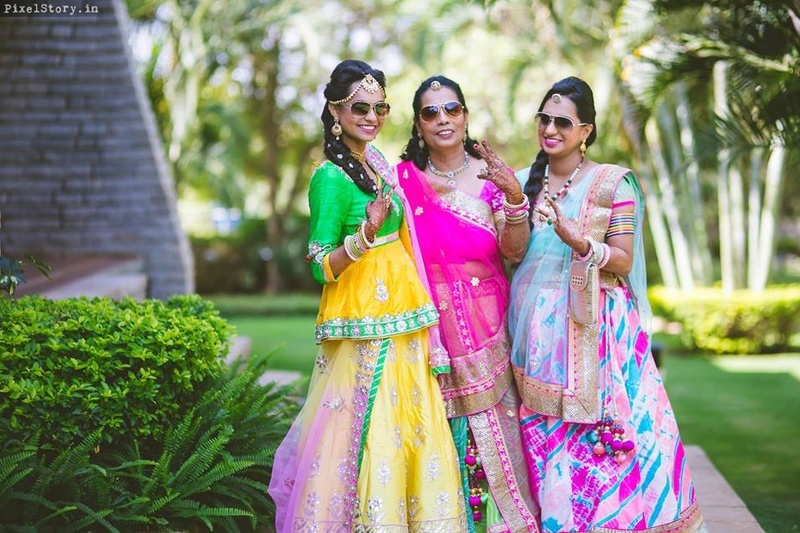 Bride and bridesmaids beautifully dressed up in colorful outfits. 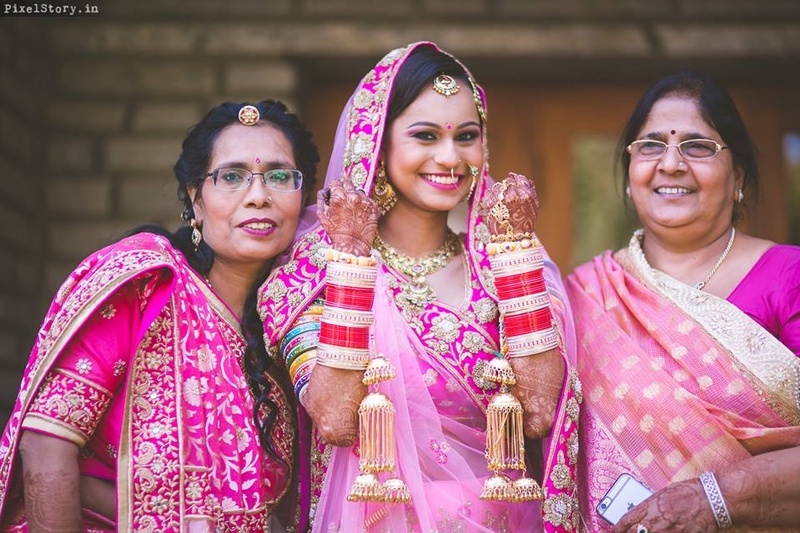 Bride Jeenal dressed up in beauiful yellow and green gotta pati lehenga with pink dupatta and gold jewellery. 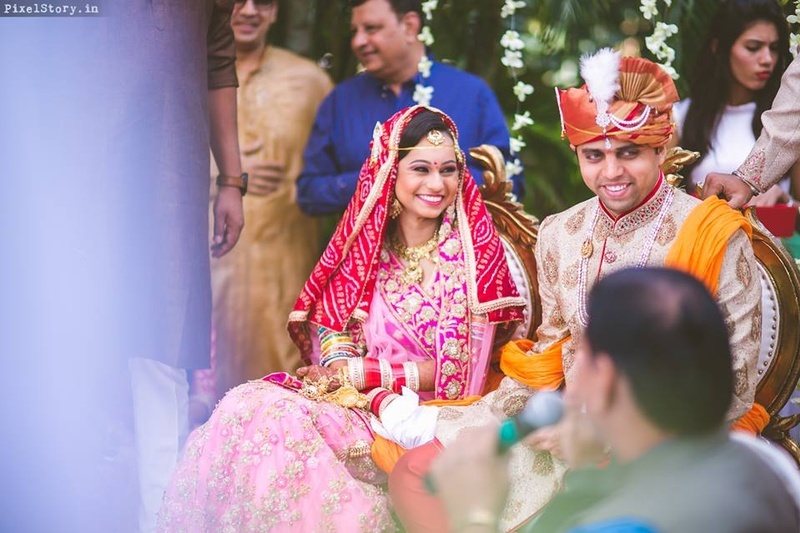 Groom wearing royal blue bandhgala sherwani for the Mehendi ceremony. 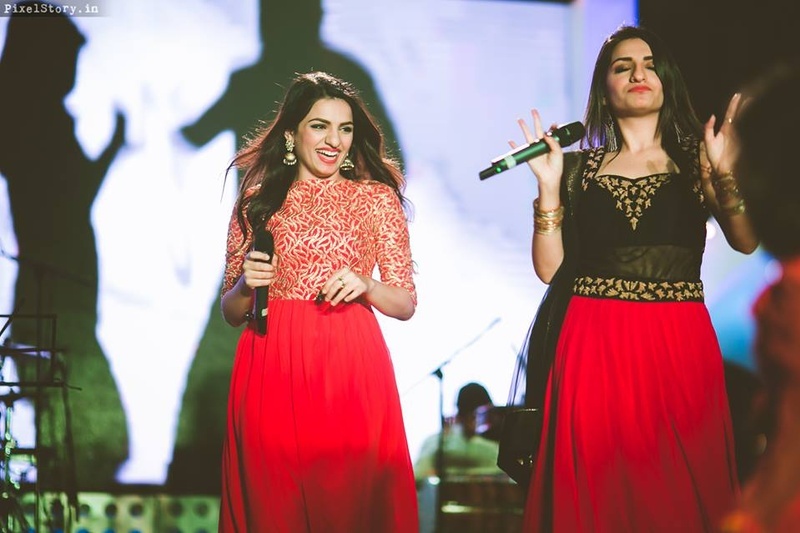 Kakkar Sisters performing on the Sangeet Ceremony. 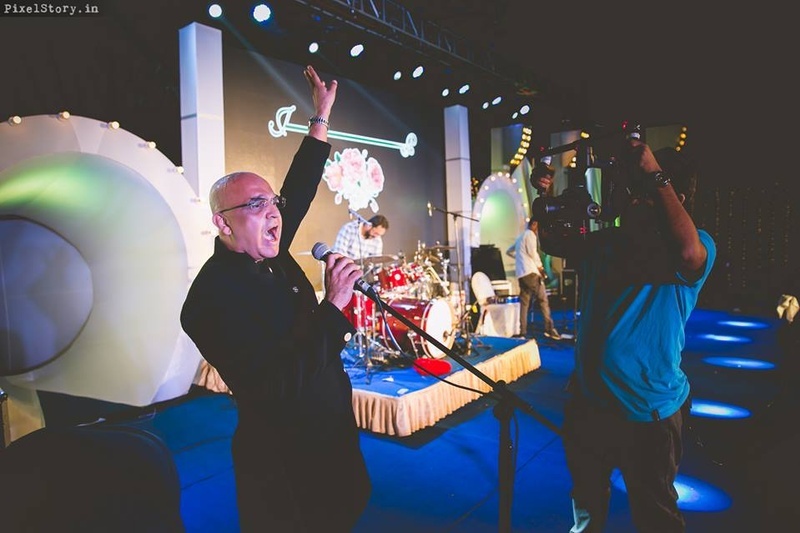 Russian band performing on the Sangeet Ceremony. 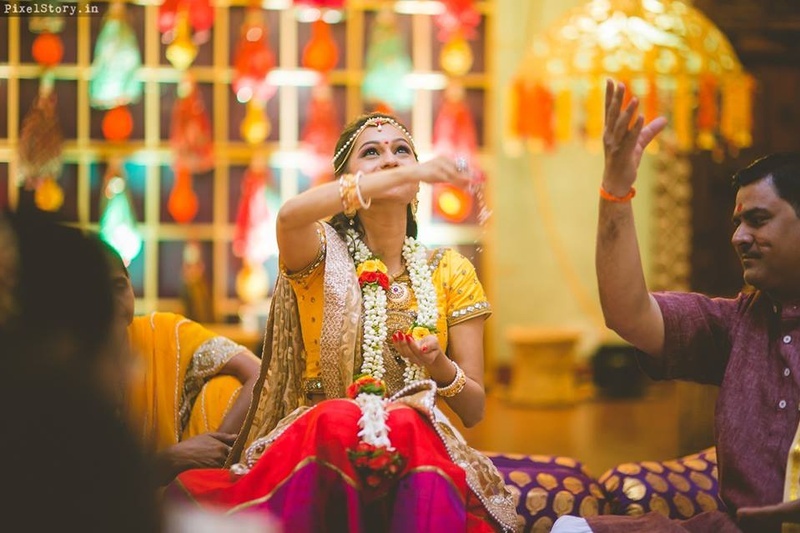 Beautiful couple doing a couple dance at their Sangeet Ceremony held at Angsana Oasis Resort and Spa. 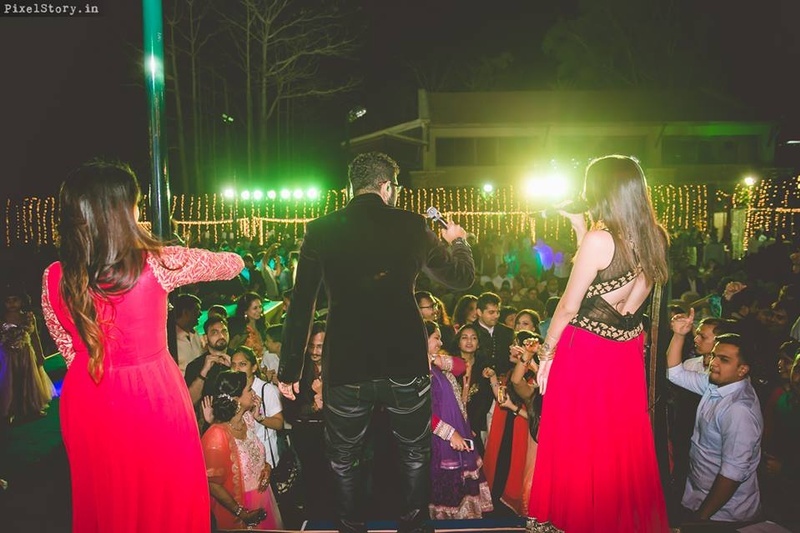 Kakkar Sisters performing at the Sangeet Ceremony held at Angsana oasis Resort and Spa, Bangalore. 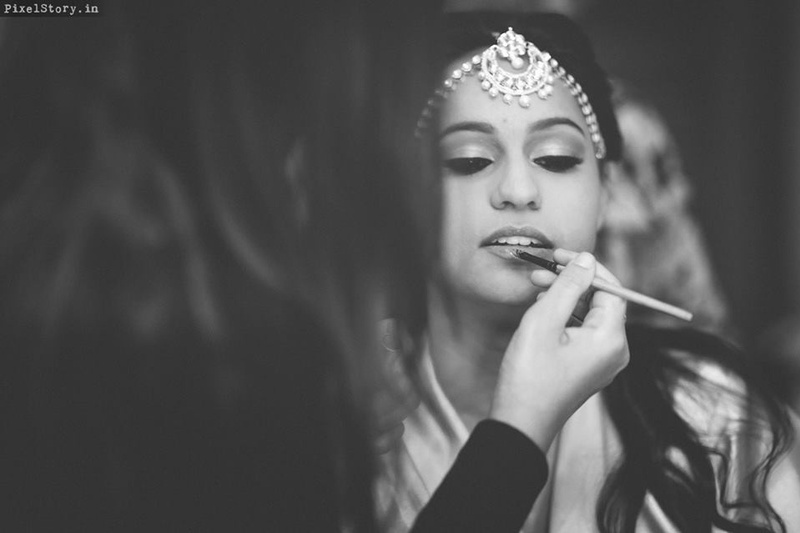 Bride Jeenal getting ready for her Wedding Day! 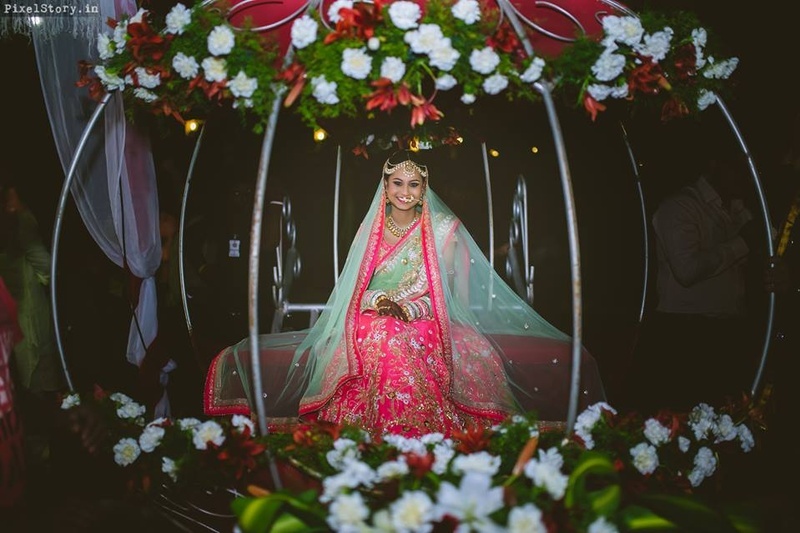 Bride Jeenal looking beautiful in this pink and turquoise blue gotta patti Bridal Lehenga. 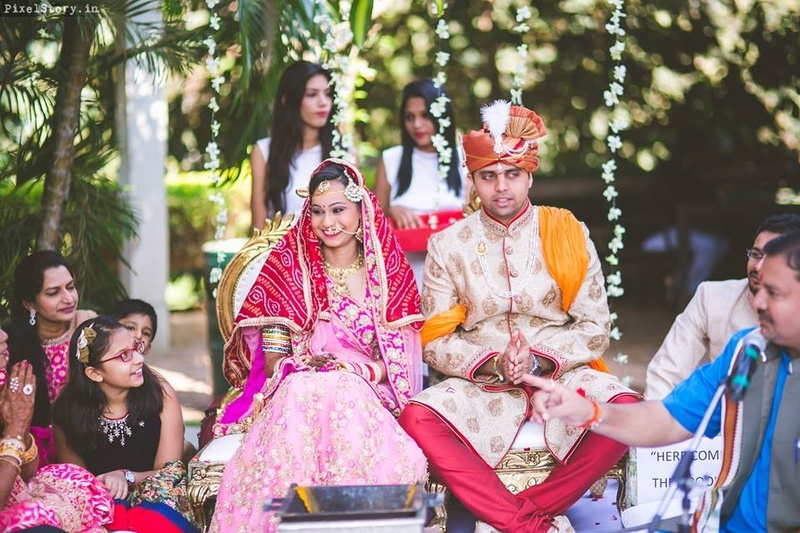 Bride and groom getting hitched. 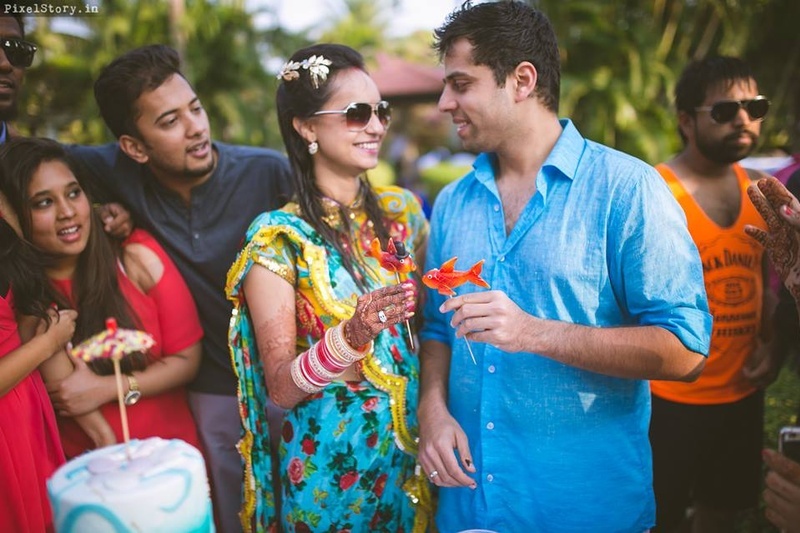 Bride and groom getting hitched at Angsana Oasis Resort and Spa. 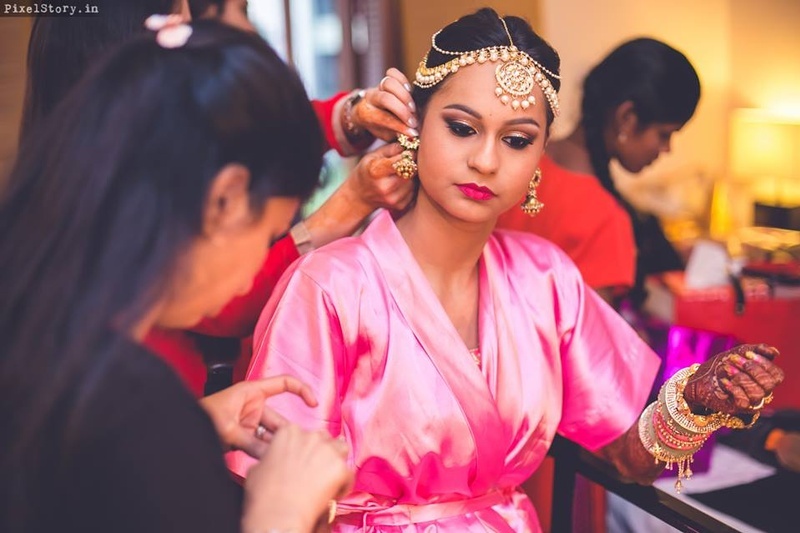 Bride and groom candid wedding photography by Pixelstory.in. 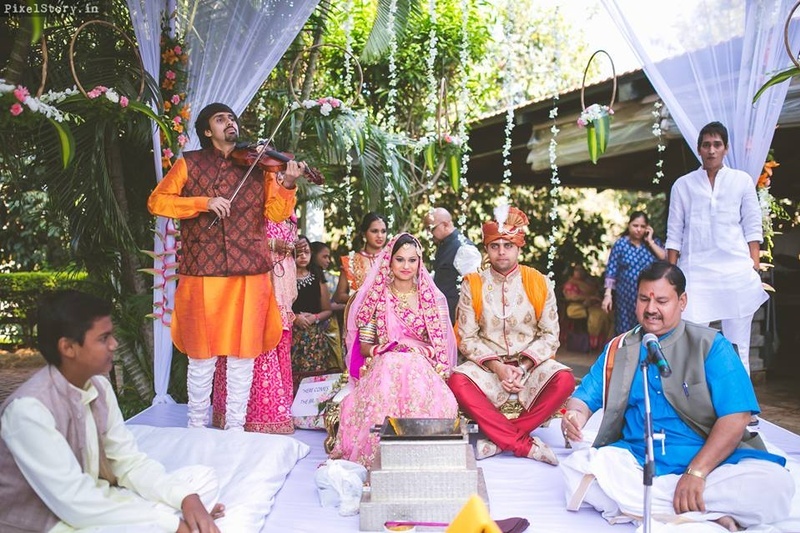 India’s only walking violinist Aneesh Vidyashankar escorting the bride and groom. 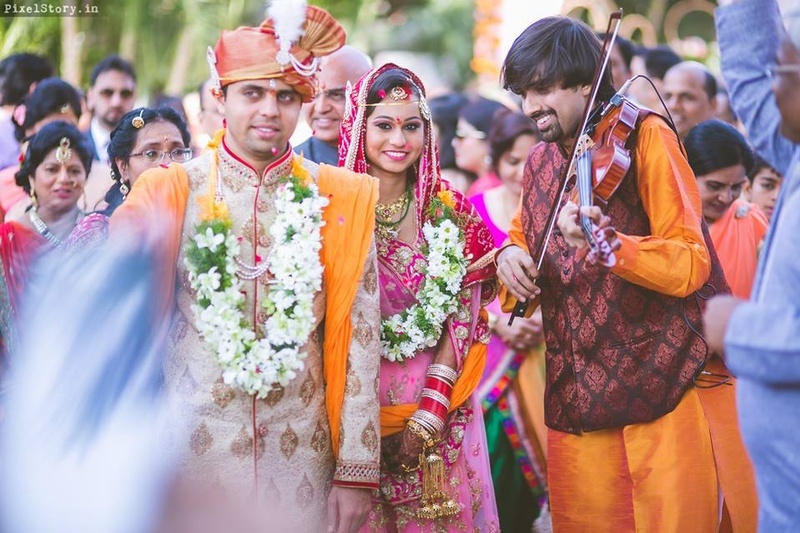 India’s only walking violinist Aneesh Vidyashankar escorting the bride and groom to the stage. 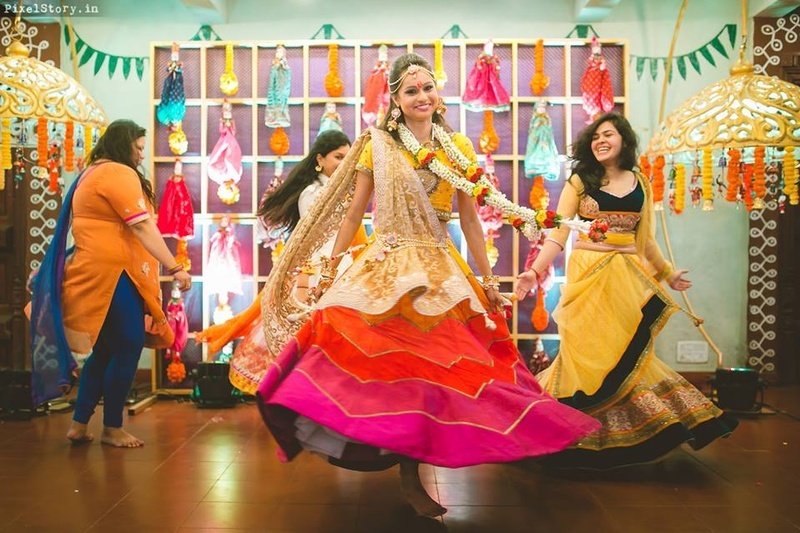 Unique and floral Bridal entry ideas. 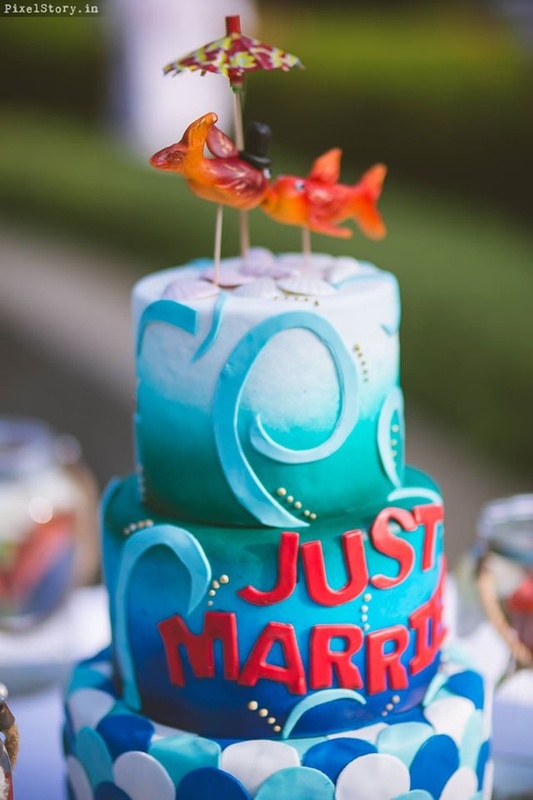 Just Married Cake for the Just Married Pool Party held at Angsana Oasis Resort and Spa. 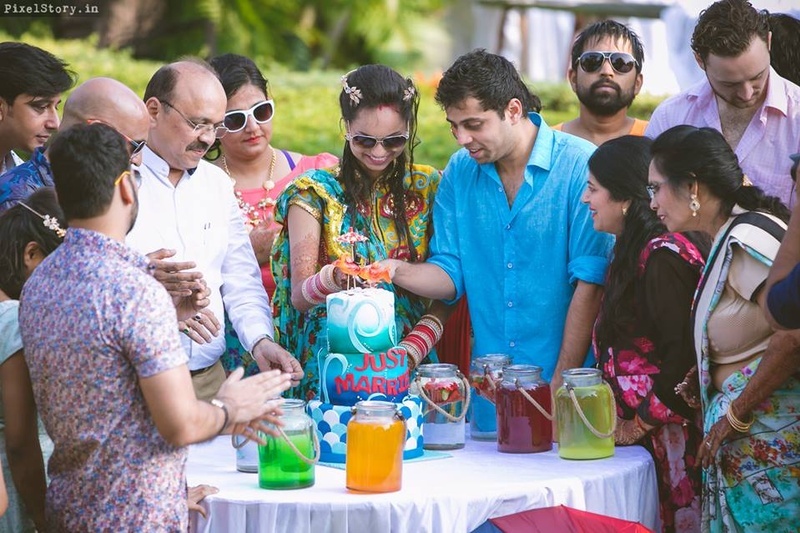 "Just Married Pool Party" fun!